Are you like me and find while reading a science textbook your eyes start to glaze over and close before you can finish the text? How about your students? Our family really loves science but I have to admit it is the experiments that we love - not so much the facts of how they work. So, when I heard that Fascinating Education offered science courses with audio-visual techniques I was intrigued. 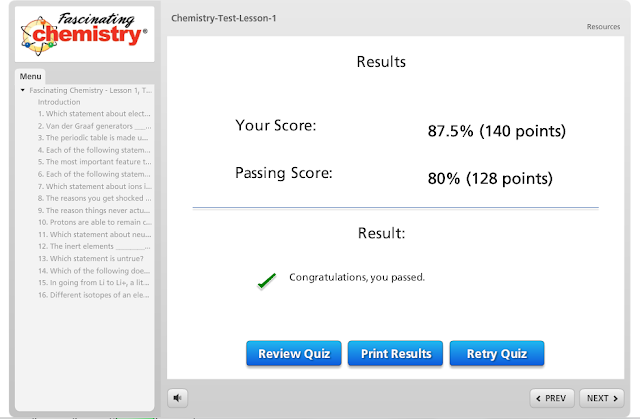 We were given the opportunity to review the online course Fascinating Chemistry with my high school son who is in the 12th grade. At first glance of the program, you will see that it contains 18 lessons and final problems . Each lesson includes several videos introducing you to the subject matter, a script of the lessons including visual aids that were used in the videos, and an online multiple choice test. The test can also be taken in PDF format if the parent or student would prefer to take it that way. You are given a secondary password only for the parent to access the PDF version of the tests and answers. Also included with the course are 11 labs . 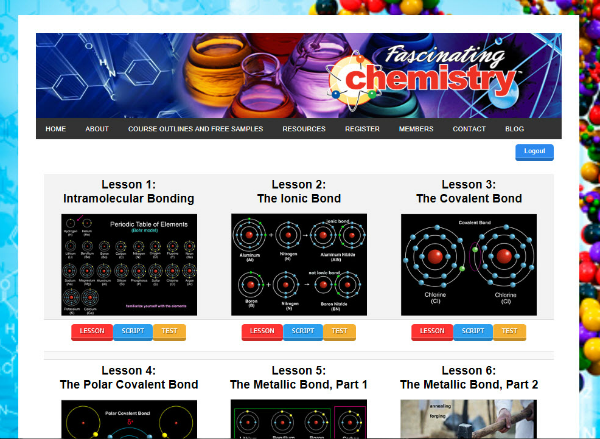 When you click on a lesson, there is a main menu tab that contains the video lessons and test. There is also a glossary tab with the definitions and terms needed to know for each lesson. We found the site is extremely user friendly but there is also a video tutorial explaining exactly what you need to do to begin. You can see the course outline here. Each lesson contains a slide titled "catching your breath" which reviews what has been taught so far and there also review slides at the end of each lesson. The course is taught and designed by author and neurologist, Dr. Margulies. My daughter overheard a lesson and said Dr. Margulies' voice sounded like one you would hear when you mash the button at a museum that explains the artifact. His voice is extremely soothing which Jonathan found made him super sleepy so he set a timer and watched the videos for the lesson for 15 minutes each day. Sometimes a little longer if he was in the middle of one. He could usually complete 2 lessons at that pace within the week. 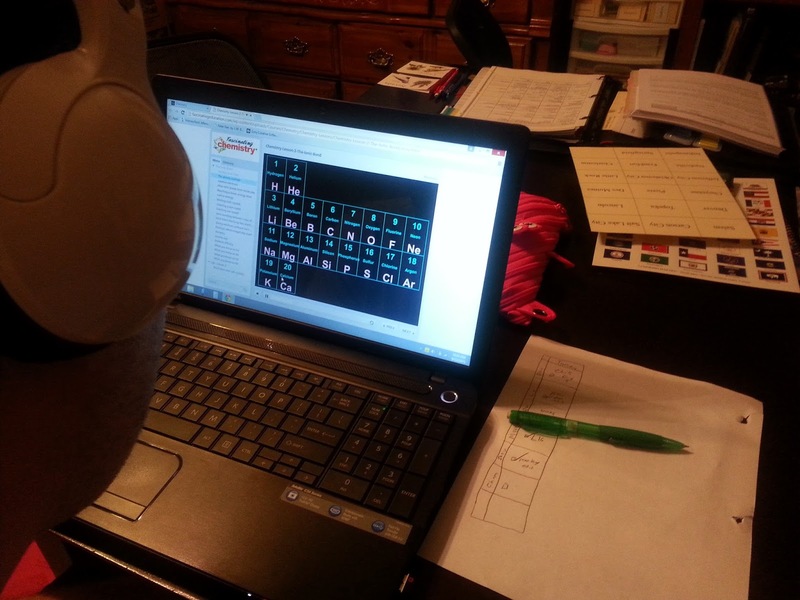 As he progressed with the course, he seemed to need more time to review so the lesson pace dropped to 1 lesson per week. Jonathan liked the way Dr. Margulies presented the information. He found the course to be very rigorous but the simplistic way that the teacher broke the terms down helped him to learn more than he ever has in a course before. Mastering the information is the end goal for the student. With mastery in mind, we took the course at on our own pace. I think taking notes and printing the script to have for each lesson also helped him. The test scores are not stored online but you are given your results at the end along with the required score for passing. You then have the option of printing the results or retaking the quiz if needed. We would recommend this course to our fellow homeschoolers. I think the video portion and visual learning along with the script to follow really helped Jonathan who has struggled with science courses in the past. The option to pace the course is working well for us. You will have access to the course for an entire year for $79. Of course, for any boy and the mention of the word "fart" when describing the chemical element of sulfur makes the course complete. Fascinating Education also offers courses in Biology and Physics. There is a discount for purchasing access to 2 courses. The price for 2 courses for one year is $125. You can also purchase access to all three courses for 2 years for $175. Click the banner below to see what the crew thought of the different courses.